Duraline Molded Stage Pin Connectors are integrally molded directly to cable in solid rubber. Eliminate potential shock hazards and will deliver safe, reliable & long-lived service at an affordable price. DELAND, FL, November 07, 2017 /24-7PressRelease/ — Stage pin connectors are not new to the industry. However, a recurring request made at the 2016 LDI International Lighting show, was for Duraline to use its solid, rubber molded manufacturing process to create safer, more durable, efficient, weather resistant stage pins than are currently on the market, while also remaining intermateable with most current connectors. And we have obliged! Our NEW Molded Stage Pin Connectors are constructed to the highest standard of quality and durability. Connectors are integrally molded directly to cable in solid rubber. (60 & 100 amp to SOOW & 20 amp to SJOOW) This process ensures that there is no wire gap between the cable jacket and body of the connector, even after years of use. Our grounded Stage Pin Connectors protect the user from accidental shocks by providing the best fit between connectors, even when used with existing connectors located on any stage setup. Duraline also offers a female connector that envelopes the male end to establish complete cover over the mating pins and virtually eliminate any chance of moisture getting into the connector. 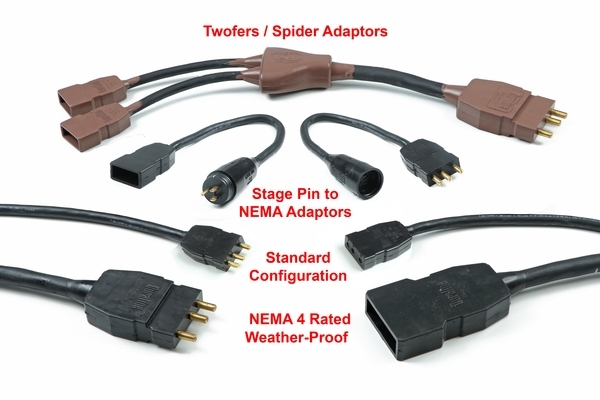 We can provide these connectors molded directly to any of our other products, such as the molded NEMA 5-15 plugs and power distribution blocks, spiders/splitters, and Wide Area LED blocks, and can also customize any compatible part needed to work in conjunction with these Stage Pin Connectors. Duraline will also offer this new Stage pin integrated into a 19 pin break-in/break-out configuration allowing a 6 leg input/output platform for pinpoint audio/lighting control. Cutting corners to cut costs is not an option when building event & stage set-ups. Equipment breakdowns create costly and sometimes dangerous situations. Duraline Molded Stage Pin Connectors will deliver safe, reliable & long-lived service at an affordable price. Duraline was founded in 1946 as a supplier of safety-engineered electrical distribution systems for the shipbuilding industries. We have since grown to supply diverse industries such as petrochemical, aviation, medical, and entertainment. Duraline Products are proudly made in the U.S.A. All of the manufacturing is done in our Florida facility. To guarantee that our products as safe, we follow the most stringent manufacturing and quality control requirements and manufacture our products to conform with several recognized industry standards. Duraline is committed to bringing the best product possible to our customers, including developing new product to match any need our customers might have. For more information on the Duraline Products go to http://www.jbn-duraline.com or Call: 386-873-2990 (Fax: 386-873-2995) 1731 Patterson Ave, Deland, Florida 32724.